Music therapists offer something very different from what other healthcare professionals offer. The difference? We work in and through music. For a society and a world that is used to seeing music primarily as entertainment, thinking of music as a measure of health and a medium for healing may seem a little bizarre. So, we often rely on metaphors and analogies to explain what we do. The thing is, the analogies aren’t sufficient. We aren’t just like OTs or PTs or psychotherapists who happen to use music as a tool in our work. We aren’t simply talented musicians who happen to have a lot of empathy and enjoy working with special populations. Rather, we music therapists have a unique therapeutic approach and set of skills based on the high level of clinical musicianship we reach through our education and training as music therapists. 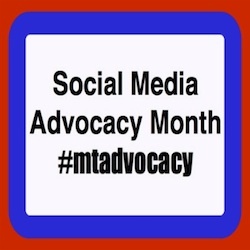 January is Social Media Advocacy Month in the music therapy world. If you haven’t done so already, I encourage you to read the post below from Judy Simpson, AMTA’s Director of Government Relations. The time has come for us to stand firmly in the knowledge that what we offer is unique and valuable.